The City of Columbia charges its customers Base Fees and Volumetric Fees for both water and sewer. Your bill adds the base and volumetric fees together to give you your Water Charges and Sewer Charges separately. Customers inside the City are also charged a Storm Water Utility Fee while customers outside the City are charged Hydrant and Fire Fees in addition to their water and sewer charges. Your water meter is designed to read cubic feet. You are charged for your water use in units of 100 cubic feet. When Columbia Water staff read your meter, they do not round up. Instead, they drop the two black boxes on your meter from the reading. This means you are only billed for complete units of 100 cubic feet. Over time, these partial uses will add up to a complete 100 Ft3 unit that will be added to that month’s bill. For example, if you use on average 750 Ft3 per month, during one month you may only be charged for 700 Ft3 while the next you would be charged for 800 Ft3 (50 from the previous month + 750 from the current month). ⦁ Consumer Confidence Report Link – Columbia Water customers can always visit the most recent Consumer Confidence Report at ⦁ www.COLACCR.com. ⦁ Previous Reading – Meter reading taken previously. This is typically the meter reading from the previous month and is often the same as the Present Reading on the previous month’s bill. ⦁ Present Reading – Meter reading taken prior to the bill being generated. This is typically the last time the bill was read. ⦁ Consumption – The difference between the Present Reading and the Previous Reading. ⦁ Water Charges – The total water charges based on the consumption units for the bill. Water charges are made up of Water Base Charges and Additional Water Use Charges. See Utility Rates for how this calculated. ⦁ Sewer Charges – The total sewer charges based on the consumption units for the bill. Water charges are made up of Sewer Base Charges and Additional Sewer Use Charges. See Utility Rates for how this calculated. ⦁ Stormwater Charges – The flat fee charged to manage stormwater runoff from a residential property. See Utility Rates for the current rate. ⦁ Total New Charges – The total new monthly charges added to the customer’s account. I received a bill this month, but it says “Estimated.” What does that mean? When a meter reader cannot access your meter or cannot see the numbers on your meter, the bill for that month will be based on an estimated use. Estimated use is based off of your average past usage. The City will continue using an estimated reading until the meter reader is able to take a reading. Why couldn’t the meter reader get to my meter? Covered by debris, trash, vegetation, a vehicle, or something else. Do meter readers ever skip meters that they can access? Our meter routes are designed so that every meter should be read for each monthly bill. Meter readers only skip meters if something is blocking them from safely accessing a meter. If you believe your meter is accessible but you received an estimated bill, call 803-545-3300. The Customer Care representative will arrange to have someone from Water Distribution explain why your meter was not read for that month. If you still have concerns, we can arrange to have someone from Water Distribution meet you at the meter to explain the issue. What can I do to help the meter reader access my meter? First, know where your water meter is. Then, make sure you do not cover it with yard waste, trash, vehicles, or anything else. Finally, make sure you have not locked it behind a gate or left an animal that might cause the meter reader concern in the yard with the meter. If you believe your meter is accessible but you received an estimated bill, call 803-545-3300. The Customer Care representative will arrange to have someone from Water Distribution explain why your meter was not read for that month. If you still have concerns, we can arrange to have someone from Water Distribution meet you at the meter to explain the issue. The meter is my property. I have put a lock on it to keep the meter readers from accessing it. Actually, the meter is the property of the City of Columbia. When you sign an agreement to have access to City of Columbia water, you agree to allow our meter readers to safely access the meter in order to bill you for your water use. Any attempts to purposefully lock the meter, block access to the meter, or vandalize the meter could be grounds for having your water service cut off. Furthermore, the City may bill you for any efforts to repair the tap if you have tampered with the meter. How are estimated bills calculated? If the customer has at least 3 months of use on record, the average of this use, up to a year, will be the estimated use. Past use is based on the customer, not the property. Therefore, if a customer has recently moved and transferred service, the average use may include use from their previous residence. 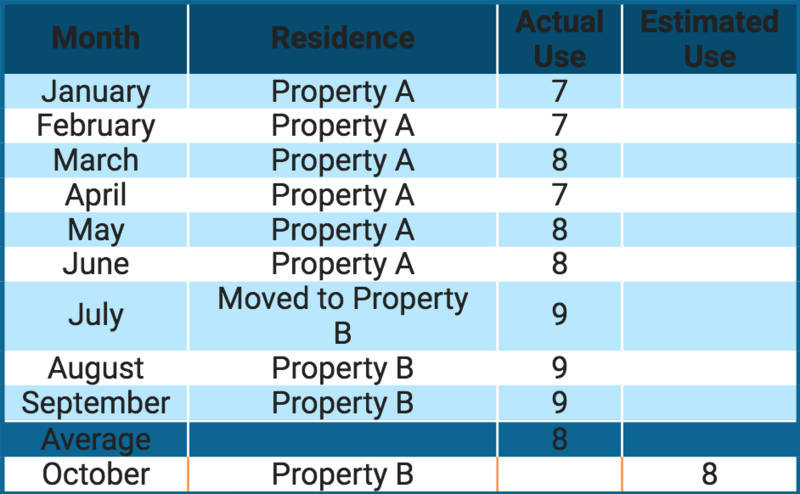 In the example to the left, a customer lives in Property A for 6 months before moving to Property B and transferring their service. After 3 months living at Property B, the customer receives an estimated bill. Even though the average use at Property B is 9, the estimated bill would be based on up to 12 months of the customer’s history. In this case that includes the previous 6 months of use. The estimated bill would be based on 8 units, the 9 month average for this customer. Once a meter reader is able to access your meter and take a reading, the City will be able to tell how much water you actually used during the time your bill was being estimated. If you used more water than was estimated, that additional usage will show up as a higher meter reading the next time your meter is read, and you may see a larger than normal bill. If you used less water than was estimated, the reduced usage will show up as a lower meter reading the next time your meter is read, and you may see a lower than normal bill.